The Astros have an incredible lineup. They play strong defense. Their starting rotation is remarkable. Their bullpen is deep and strong. And, Alex Bregman cannot be stopped. Or at least the Twins couldn’t find a way all series. Jorge Polanco and Max Kepler each had two hits, and Willians Astudillo homered for the Twins. Early in the game, things looked OK for the Twins. Jake Odorizzi started out with two scoreless innings. The Twins had their opportunities early against Astros rookie starter Framber Valdez. They had runners in scoring position but were unable to capitalize. Odorizzi then gave up two-run homers to Alex Bregman in the third inning and Evan Gattis in the fourth inning. And from there, the Astros piled on a bit. Odorizzi just didn’t throw enough strikes. 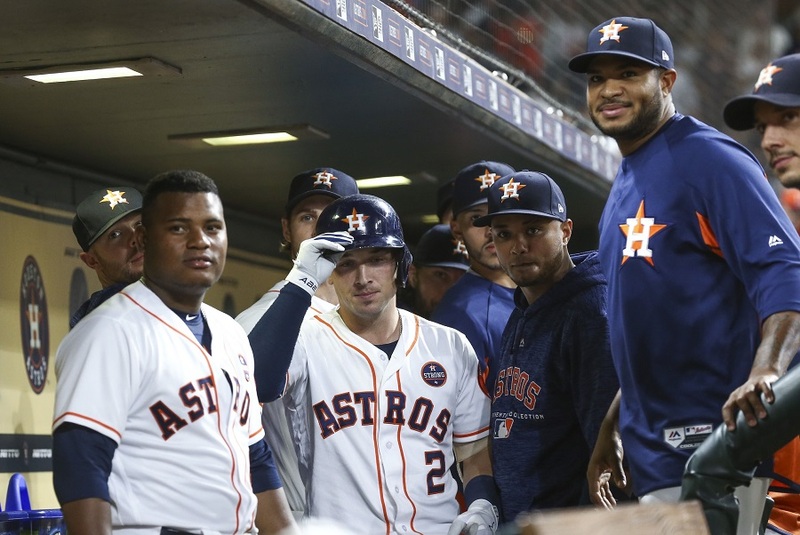 As much as the goal was to not let Bregman beat them, he had the two-run homer and in the eighth inning, he put the icing on the cake with a bases-clearing double. On a related note, I like cake. I rarely have cake, but I do like it. Sometimes I like just the vanilla cake with vanilla icing. Sometimes, chocolate cake is good, especially with some creamy chocolate icing (most of the time it’s a little too rich for my liking). My favorite might be vanilla (yellow) cake with chocolate frosting. Although strawberry shortcake is also fantastic! Back to Jake Odorizzi… in his post game presser, Mike Berardino asked him if he might be interested in being a “Primary” pitcher. Fair to say he doesn’t seem too interested in it. Anyway, back to the Twins. Willians Astudillo DHd and hit a home run. He now has two home runs, two strikeouts and zero walks. Yes, his scouting report and minor league track record have been proven pretty accurate through his small-sample-size big league career. It was a rough game for Tyler Austin on Wednesday. He started and played first base. He went 0-for-3 with three strikeouts. Later in the game, he was chasing a pop up, but he slipped on the warning track near the first base dugout and landed hard. An inning later he was removed from the game for a pinch hitter for precautionary reasons. Austin now has 26 strikeouts in 78 plate appearances (33.3%). While that isn’t great, it is worth noting that in his time with the Yankees this year, he struck out 40.1% of his 132 plate appearances (53 Ks). Also of note, he has seven home runs in 78 plate appearances with the Twins. He had eight home runs in 132 plate appearances with the Yankees. Improvements. Andrew Vasquez (8), John Curtiss (24), Oliver Drake (7), Taylor Rogers (6), Matt Belisle (29). What else got your talking and asking questions throughout Wednesday’s game? MIN 10, TEX 7: Tex-plosion! Nice to see Belisle finally pushed his number of ERs ahead of his IPs. I'm not sure Austin's strikeout numbers are all that encouraging. His number of PAs with the Twins is just over half of what he had for the Yankees this season. A few more Ks while rounding out those last 50+ PAs and his K% is pretty close to the 40% mark it was at when he left NY. Please. Can someone tell me just what the point is of having Belisle on this team? At 63-76, we are as good as the Mets. Strikeouts are part of the game today. The average American League team strikes out 24.3% of at bats. Sorry, ESPN didn’t list PA. For a guy with Austin’s power, 33% is a completely normal rate in today’s game IMO. For his career, Austin’s K rate is basically the same as Sano’s and Austin has a slightly higher HR rate. I would expect Austin’s K rate to go down slightly with more consistent at bats than he has received to this point in his career. If it is a normal rate than why is it that Chris Davis, Yoan Moncada and Joey Gallo are the only batters with "qualified" AB to post that number this year.? 378 playerss have 150 ab, 19 have a K% greater than 33.0%Sorry, 33% is not normal. MLB non-pitcher K rate is 21.6%. Only 3 qualified batters are at 33% or worse, and none of them are particularly good in 2018 (Gallo is okay, Moncada a bitty iffy, and Chris Davis a disaster). Looking at the top 50 qualified batters by isolated power, only 4 of them eclipse 30% K%. So no, I wouldn't call 33% "completely normal" for anyone (at least not anyone good). Except for Berrios, Gibson and Rosario I don't think any of our players would start on a contending team.I don't think the Twins can save Buxton or Sano.I think they need to go to a team that can help them.Maybe that is the end game either the Twins don't want to have to pay them or Buxton and Sano want to go.I assume next year we will be wondering what happened to Berrios.Hicks is doing very well surrounded by real MLB players.We have nothing.I think Berrios and Romero will suffer If they don't bring back Santana.He has been a good mentor for them.So many others have been allowed to slide this year.Kepler has been okay but not good. Dozier got his pass waiting for the 2nd half.Morrison who knows what but he finally has an "injury".Grossman probably wouldn't make a average team roster.Mauer is good but should be at another position but the Twins wouldn't pay for a decent 1st baseman anyway.They would try to find some old veteran.If we lose Santana that is going to hurt starting pitching.It is a mess and I don't think the minor leagues are going to save next year. Imagine - Sano and Austin together each striking out nearly 40% - great for the pitcher statistics, but not acceptable in my ideal line up.I like to see us score without the HR. Belisle is now so well entrenched in Twins history that his story will be told generations from now over a strong shot or two.It is just unbelievable, to me, that the FO and Mgr keep putting him out or that he doesn't just shut it down.Can't we have one of those magic injuries that put him on the shelf? Five losses in a row - 76 losses total.If they can play 500 the rest of the way they can avoid 90 losses, is that important? We got to see Petit, Grossman, Field, and Gimenez yesterday - does that help the team?At least Astudillo is entertaining. Odorizzi is sure to carry over to next year - does that excite anyone?I laughed when they asked if he could be the opener in the future.Of course he said no, but in essence if he were pulled when he should be he is already an opener. Curtiss no longer looks like he is going to be an MLB arm.Something happens when he comes into the bigs.What is it?I do not want SSS as the answer, In his career he has been in 12 games and has an ERA over 10.Mental or physical? This year has been a HUGH let down.After last years late season improvements I though these young guys were putting it together.Now, I have very little faith in this team or do I see anyone worth keeping except for Joe at a discount, Polanco, Berrios and Rosario-but he's got to stop swinging at every pitch.Other then these 4 players, everyone else looks like they could easily be replaced.Biggest disappointments, Sano,Kepler,Buxton.After that we have some OK players- Garver,Hildenberger,Rogers.That gives me 7 Roster players with 33 spots we could fill with other players then we have now.The idea of just wait these guys are young was wasted this year.Sano,Kepler,Polanco,Buxton,Rosario,Berrios as the leaders has been a bust and these guys are not Rookies anymore and I don't see some of these guys getting much better with age.Just my thoughts, is it time to blow this team up or do we just keep waiting on Sano,Buxton,Kepler, and the young pitchers? I'm not seeing it after playing Cleveland and Houston.We are way off the talent of those teams. Very sad I'm having to Post this. The current on field payroll is 56m with Mauer getting more that 1/3 of that.Only 6 others over 1m and 3 of those are pitchers who maybe play a game or two each week.Reed, Ordorizzi, Forsythe, Gibson, Grossman and Adrianza.I guess you get what you pay for. Keep losing, and get some better draft picks (translation; more slot money). Can Belisle be the opener for primary pitcher Gimenez? Carrot cake with white-chocolate cream-cheese frosting! I still really don’t get lumping Kepler in with Buxton and Sano as some huge disappointment. He has a 2.5 bWAR. Sano and Buxton are both in negative territory. Does Kepler have room to improve? Certainly. However, this season he greatly improved vs LHP. So that tells me he is capable of making adjustments to improve. So, there is no reason to think he won’t continue to do so. If he isn’t meeting the arbitrary expectations of someone, that is THEIR problem. I think he is progressing quite nicely. Certainly far better than Sano or Buxton. This year the cake of choice seems to be Boston Cream Pie. To paraphrase the Soup Nazi: "No cake for you, Twins' fans". bWAR is just one of many stats.This is Kepler 3rd full season in the Bigs, here are the numbers I'm looking at, by year 2016,2017,2018 also Kepler has close to 1400 ab's career.AVG. .235, .243, .226 he's going the wrong way, OBP- .309, .312, .318 Better but just OK. OPS-.734, .737, .734. No improvement, just OK, Now- Cave- Rookie year 200 Ab so far.AVG .261, OBP .310, OBS- .798.This is why I say most of these guys can be replaced. My point is Kepler is not playing above (a -our) replacement Outfielder and isn't showing vast improvement.Kepler is just another Big League Outfielder,And I like the guy, but he's not cutting it, for this team to get to the playoffs, just another 7th place hitter in the league. HO HUM. Same goes for Sano. bWAR is just one of many stats. This is Kepler 3rd full season in the Bigs, here are the numbers I'm looking at, by year 2016,2017,2018 also Kepler has close to 1400 ab's career. AVG. .235, .243, .226 he's going the wrong way, OBP- .309, .312, .318 Better but just OK. OPS-.734, .737, .734. No improvement, just OK, Now- Cave- Rookie year 200 Ab so far. AVG .261, OBP .310, OBS- .798. This is why I say most of these guys can be replaced. My point is Kepler is not playing above (a -our) replacement Outfielder and isn't showing vast improvement. Kepler is just another Big League Outfielder, And I like the guy, but he's not cutting it, for this team to get to the playoffs, just another 7th place hitter in the league. HO HUM. Same goes for Sano. The fact that Kepler’s batting average is going down but his obp is going up indicates increased patience and strike zone awareness, which is a good thing. Indeed, his BB rate is a career high 11.2% and his K rate a career low 16.6%. Both fantastic numbers compared to some of the players on the roster. His line drive rate of 24% is slightly below league average of 26%. The number that always jumps off the page with Kepler is BABIP. His career number is .260 which is extremely low. This year it is .242. I’m not qualified to analyze his swing to determine what might be the cause. I’ve speculated shifts, but am not certain that would account for all of it. Point being is that everything suggests that what Kepler needs is fine tuning. Of what exactly, I can not say. Can the Twins staff do that? If they can’t they need to employ people who can. The tools are there. The baseball acumen is there. Strike zone awareness is usually one of the hardest things for young players to master. It makes zero sense to replace a guy who has that skill. He may never be more than an “average” major leaguer. So? Teams need those. No team has a roster full of all stars. Right now his numbers suggest he is completely worthy of a starting job. Sure, but what made this game embarrassing was Belisle and the fact that the Twins weren't plating runs. We always knew Odorizzi isn't an ace. He's performing like a #3/#4 pitcher, which is exactly what he is. The Twins have to hit much better if they want to win games not pitched by Cy Young. If you can't score 4-5 runs, you're going to lose most games. Last night's lineup would probably finish top-half of the International League.Maybe. You just look for interesting players with a chance of being pieces in the future.The other day, we had Stewart...this game?...I don't think Astudillo DH'ing is in the Twins plans...but, Garver continues to look like a major-league hitter and wasn't terrible behind the plate.Twins fandom! Yeah I get that... I'm not referring to just this one individual start. I'm referring to his numbers for the whole season. I've been saying for some time that Odorizzi is a good pitcher, but that his role can't be managed traditionally. Some of the strategies that are being proposed (Opener, Piggybacking, etc.) are ideal to maximize Jake's productivity. He's good in smaller bursts (75 pitches) and has good stuff. The lack of command has a confounding effect on the third time through the order problem. Better command likely would lead to lower pitch counts and longer starts. But unless Odo cuts down on the walks/wildness and pitches more efficiently, he will only ever be a 5-inning pitcher. Some of that is on him, and some is on Paul Molitor and how he uses him. Can anyone ask the the MOY and GM why Field, Grossman, Gimenez, and Belisle are playing, let alone on the roster? Is there any plan here at all? Twins fans, here is your daily standings site! His line drive rate of 24% is slightly below league average of 26%. The number that always jumps off the page with Kepler is BABIP. His career number is .260 which is extremely low. This year it is .242. I’m not qualified to analyze his swing to determine what might be the cause. I’ve speculated shifts, but am not certain that would account for all of it. I'm not sure where you got the 24% number, but Fangraphs is showing 16.4% for Line Drives. He does seem to have a good approach and good control of the strike zone, but perhaps some work on swing mechanics would result in better output.From a layman's perspective, he seems to pop the ball up way to much. I'm a Kepler fan and am hopeful that he's a slow burn to being a part of the long term solution.He's still just 25 and younger than any of the OF that are currently with the Twins. He does seem to have a good approach and good control of the strike zone, but perhaps some work on swing mechanics would result in better output. From a layman's perspective, he seems to pop the ball up way to much. I'm a Kepler fan and am hopeful that he's a slow burn to being a part of the long term solution. He's still just 25 and younger than any of the OF that are currently with the Twins. Baseball reference is a little more user friendly with my phone I have found. That’s why I use it more. For example, I couldn’t figure out how to find out fangraph’s league average line drive %. But just eyeballing team stats, it’s 21-22%, which is also lower than what b-r has for it’s league average. But Kepler is considerably lower on fangraphs. Not sure why there would be such a discrepency.